This week Workday presented Allied Global with our first Workday Inspire Award. This award recognizes outstanding customers that are doing an amazing job of leveraging business insights from Workday to deliver quantifiable results for their organizations. Three customer finalists were selected from the submissions ─ Allied Global, BB&T, and Kimberly-Clark ─ with Allied being named the winner. 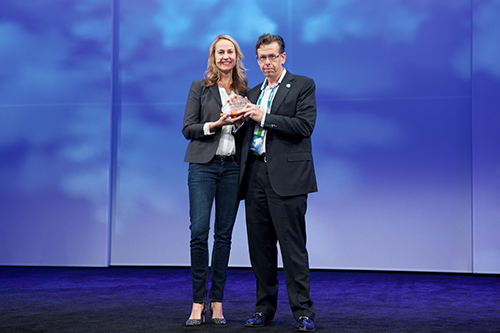 We awarded the Allied Global team with the Workday Inspire Award trophy at Workday Rising 2014, plus one all-inclusive trip to next year’s Workday Rising. Thank you to all of our Inspire finalists ─ you’ve truly inspired us with your incredible stories of business innovation and transformation. Allied Global. Headquartered in Toronto, Allied Global has 1,300 employees in four countries and uses Workday Financial Management, Workday Human Capital Management, and Workday Payroll. Allied is a people-driven global company that was operating without a single view of its workforce and with limited visibility into its financials, essentially “driving the bus in the dark.” Before Workday, it relied on a disjointed ERP system that was not global or effective at delivering analytics to drive fact-based decision making. As a result, Allied often overshot and undershot contracted man hours worked, eroding margins and missing out on $100,000+ bonuses. In less than a year, Allied went live on the full Workday platform in four countries, gaining the ability to review client profitability, labor cost behavior, turnover trends, staff performance, and the recruitment pipeline all within one system and at various levels of the organization. Allied has used these insights to slow its revenue “leakage and shrinkage,” increasing EBITDA and driving efficiencies for the finance team. With the help of Workday, Allied has reduced attrition rates from 50% to 42% and can make sure the right people are on the right accounts, while doing a better job at recruiting and managing employees. BB&T. Headquartered in Winston-Salem, N.C., BB&T has 33,000 employees with 1,844 financial centers in 12 states, and uses Workday Human Capital Management, Workday Payroll, and Workday Time Tracking. Prior to Workday, BB&T was using multiple incompatible systems for HR with complicated and messy integrations that required major resources to manage. Consequently, the HR team spent a lot of its time manually creating reports for managers. BB&T now has one unified system for HR and is using real-time data to make better business decisions and positively impact the business. As a result, the company has increased associate retention and decreased turnover, with the ability to identify trends and issues such as a spike in terminations for a supervisory group or job profile. BB&T has also improved workforce planning with the ability to monitor growth in headcount and FTEs and report on variance-to-plan data. Kimberly-Clark. Headquartered in Dallas, Kimberly-Clark has more than 42,000 employees in more than 60 countries and uses Workday Human Capital Management. Kimberly-Clark has been on a five-year People Strategy journey to transform its culture and “unleash the power” of its people. Part of this strategy involved launching one global unified HR system so that it could have better visibility into its workforce. Prior to Workday, Kimberly-Clark had various HR systems across the world, which limited its visibility into talent, costs, and performance. Kimberly-Clark has now been able to use Workday to transform HR into a fact-based organization, with 88% of leaders leveraging Workday data to manage the business and drive decisions. The company is better able to accelerate development of top talent, model internal labor markets, and gain key insights into hiring, turnover, and movement in the organization. It has also been able to analyze the potential retirement risk for “baby boomers” to help drive workforce planning in critical functions, ensuring succession and knowledge transfer. Congratulations to all three customers on their accomplishments!